Keller Williams has a lot to be thankful for this holiday season, and so do fans of bluegrass, for in the spirit of gratitude Williams has brought together a phenomenal group of his brothers in bluegrass for two very special “Thanksforgrassgiving” shows in the part of the country he calls home. After everyone has had their fill of turkey on Thursday, the all-star band will play Friday, November 27th at The National in Richmond, Virginia, and Saturday, November 28th at the 9:30 Club in Washington, DC. Williams’ partners in picking for the weekend include legendary Larry Keel on guitar, with Chris Pandolfi on banjo and Travis Book playing bass, both hailing from the Infamous Stringdusters. 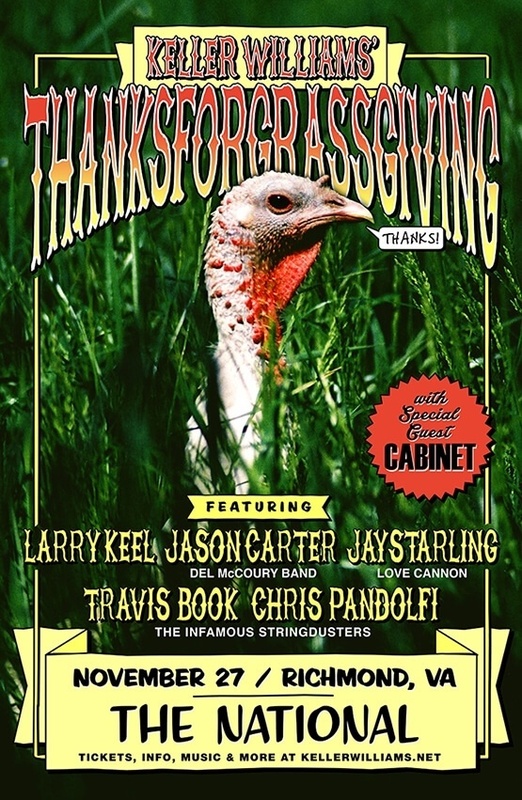 Jason Carter from The Del Mccoury Band will play fiddle and the dobro will be manned by Jay Starling of Charlottesville’s Love Canon. Williams plans on digging in with a mandola, which should allow him to set the tone and take his familiar role as one of the most diverse bandleaders around. “This is a hand-picked band of heathens that has allowed me into their world.” Williams said, outwardly thrilled to be surrounded by such a wealth of talent. This will be a reunion of sorts for the artists on stage, as Williams has played and written extensively with Keel, and jammed with all of the other members plenty of times over the years. The opener for both nights is Cabinet, an energetic and young slamgrass band out of Eastern Pennsylvania popular for packing in the fun at every show. “It’s going to be loose, and a lot of of good friends hangin’ out and pickin’, trying to have fun and make people think and dance, and not think,” Williams said.